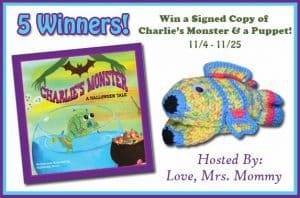 Welcome to the Signed Copy of Charlie’s Monster & A Puppet Giveaway! A devoted fish name Charlie lacks the courage of confronting things unknown to him. There’s only one thing that Charlie loves more than his new home, and that’s living with his best friend Bobby. One day, Charlie’s new home got spooky, and he comes face to face with a monster. Will Charlie muster enough courage to defeat the monster? Will Charlie use all his strength to protect Bobby? Read this delightfully fun book to find out!